Finally, maple season has started here at the farm. 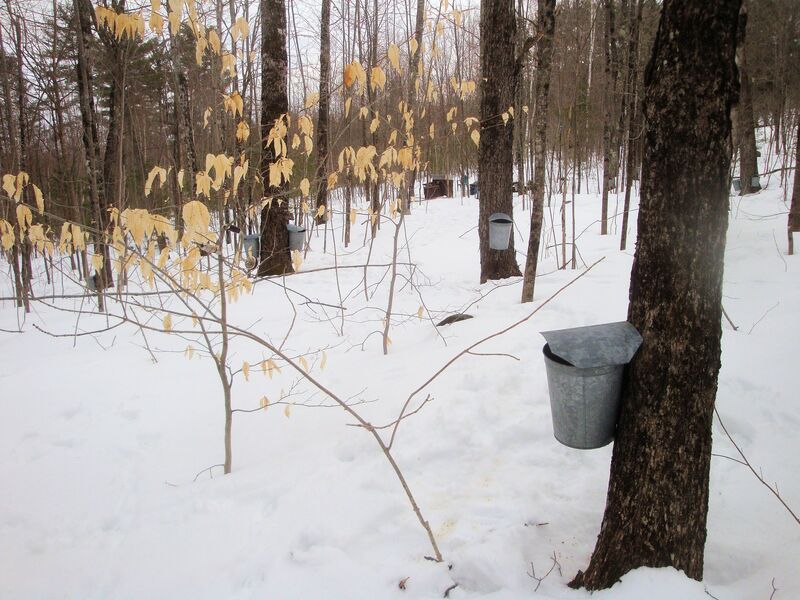 Last week we tapped the maples and have 25 buckets collecting sap. So far we got enough sap to make about 1.5 gallons of syrup. The first batch is in the house ready to finish. 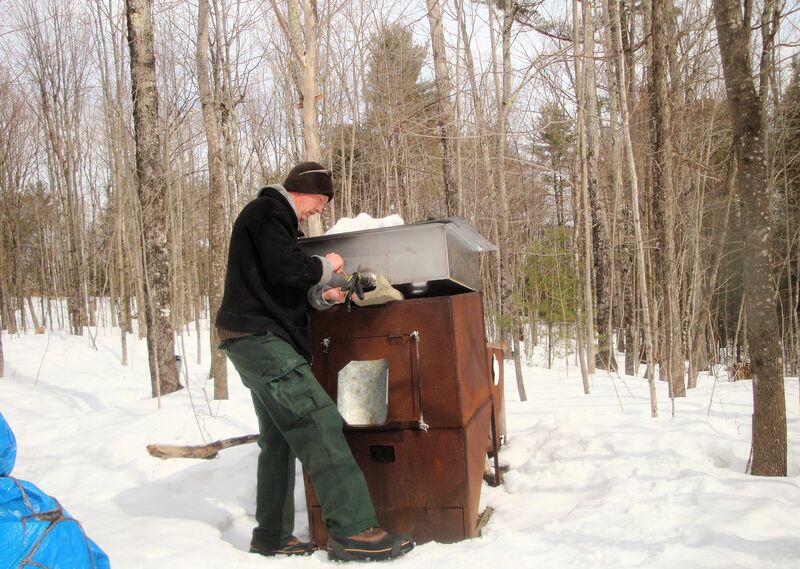 We do the majority of boiling outside, down in the woods where the sap is collected. The evaporating pan sits on a wood fired stove. This way most of the 39 gallons of water that must be boiled off to get one gallon of syrup will go into the atmosphere and not into our house. When the syrup is reduced to about 4 gallons we carry it to the house and reduce it to syrup on the stove where the temperature can be better controlled. I drill each tap hole with my antique hand drill, making a 7/16″ hole for the spile. The sap runs out the spile and into the bucket. On a good run day when the temperature is in the 40sF and it’s not too windy, a tree will nearly fill a 2 gallon bucket. Older trees that are over two feet in diameter can have more than one tap in them. 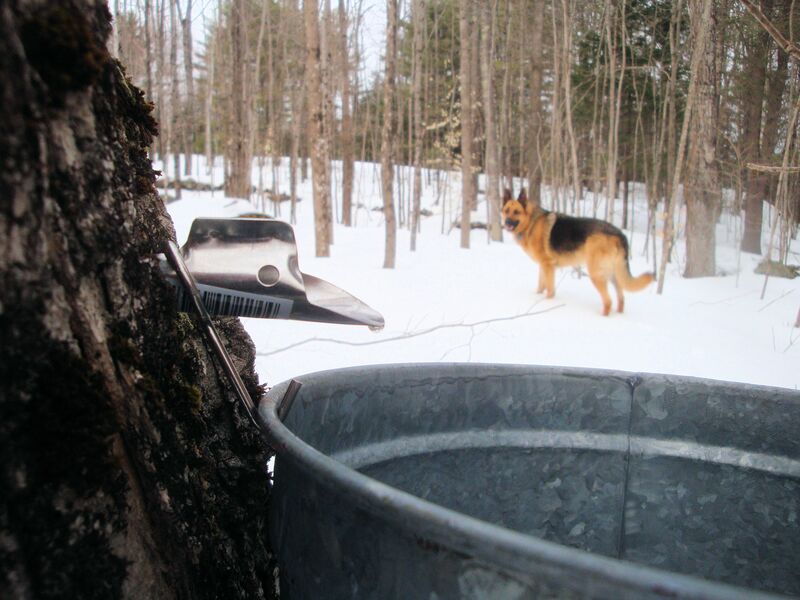 When the sap is running well, the sound of drops plinking into buckets fills the maple sugar bush. This time of running sap and early spring work passes quickly. In a blink the snow will be melted away and the temperatures stay above freezing at night. The trees start to open their leaf buds and sap season is over. 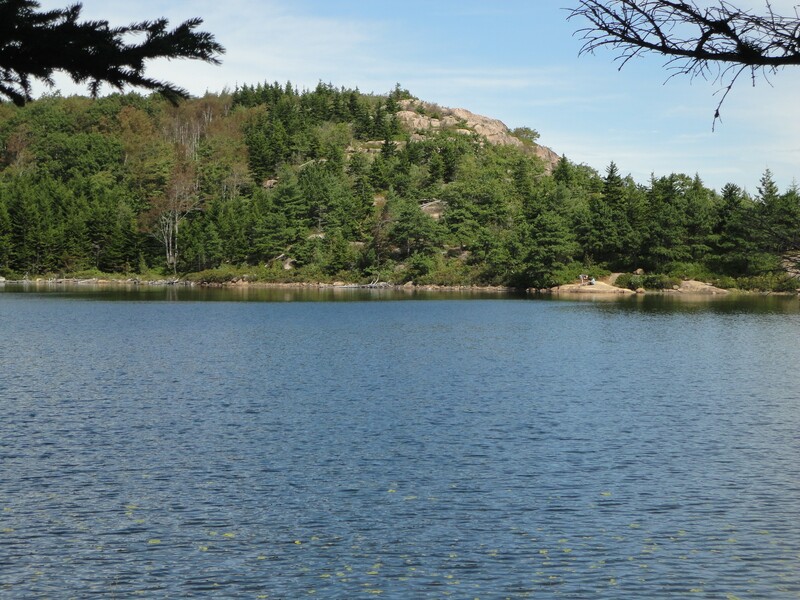 Spring is right around the corner, (and through 2 feet of snow here in Maine) bringing with it dreams of hiking the many beautiful trails of Acadia. A special little gem well worth the walk is The Bowl, a small pond near The Beehive on the east side of the Park. The Beehive is a round, rocky little mountain that can be viewed to the north from Sand Beach. The trailhead for The Beehive and The Bowl starts almost across the road from the entrance to Sand Beach. On any hot day, one lane of the one-way road will be choked with overflow parking for the beach. On a quiet day, you can park in the beach lot and walk up to the trailhead. The entire hike is about one-and-a-half miles, maybe two. Unfortunately, at the beginning it is rather rough and steep going. The woods is filled with piles of granite boulders that tumbled off The Beehive. 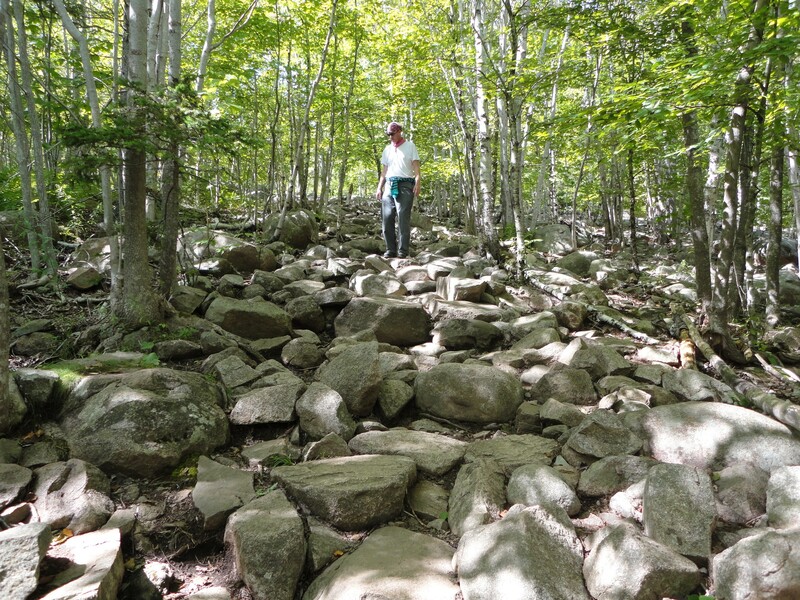 The trail leads over and through the boulder field. 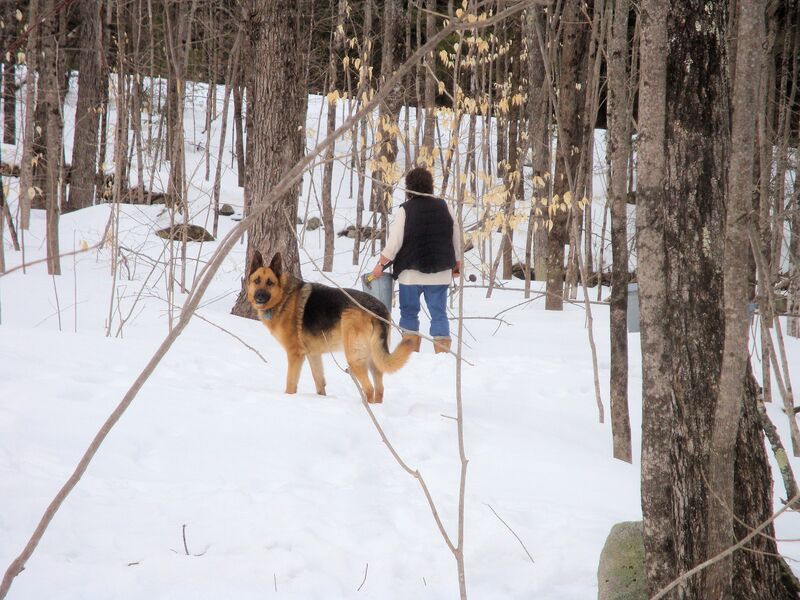 After a way the trek becomes less challenging, more like a quiet walk in the woods. It is all uphill, but not at too difficult an incline. A few hundred feet along the path, there is an intersection, take the left trail to The Bowl. The thick woods filled with shadows, quiet rustling in the undergrowth, birdsong and the whispering of leaves in the sea breeze is a welcome cool spot on a summer day. Just about the time you wonder how long a half-mile can be, you come out at the prettiest little pond. On the northeast it is steeply flanked by the low Enoch Mountain. The water is pure, cool, clean and transparent. The bottom of the pond is lined with sand, large rocks and some mucky mud. Little fish dart in the shallows. Out in the center, rippling rings spread from spots where larger fish have broken the surface to nab a fly for lunch. 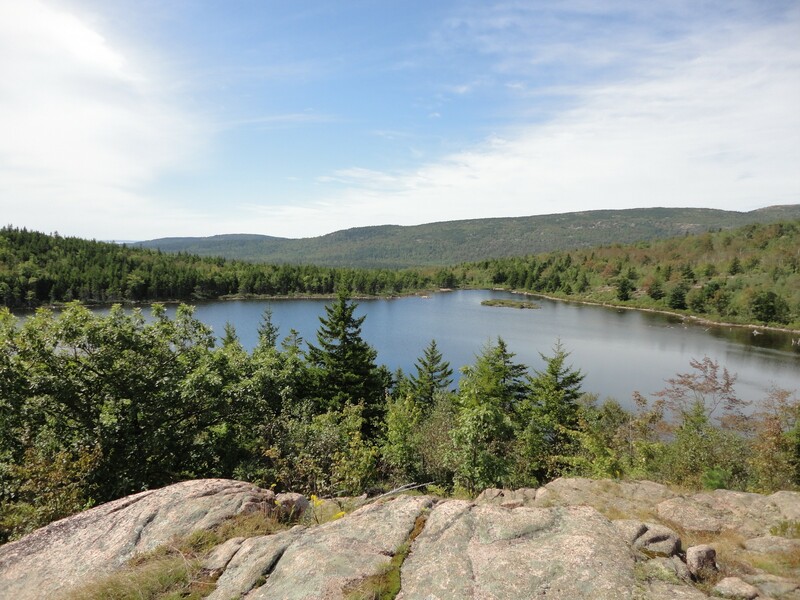 The trail passes along the southern and eastern side of the pond then up Enoch Mountain. From the top, the view is spectacular. What else could it be at Acadia? After returning to the pond, it is all right to slip off your shoes and dip your hot feet in the water. The Bowl is not a public water supply protected from contact with humans. 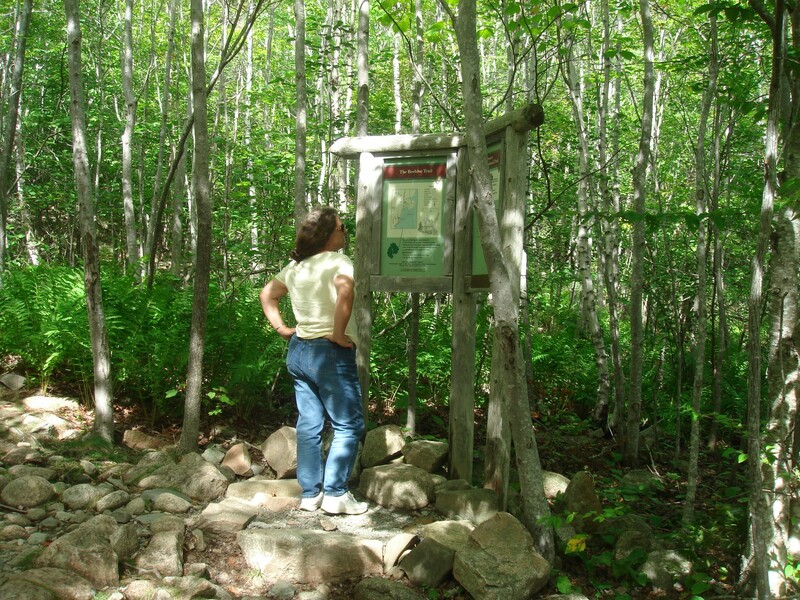 The adventurous hiker might prefer to swing back from The Bowl along the Beehive trail, across the back ridge of the mountain, then down the steep face to return to the trailhead. I prefer retracing the path I followed in. It’s all downhill to the road. My knees are not as fond of mountains as they were in their youth. For Christmas my brother gave me a genetic test kit. You send in a sample to a company and they determine your genetic heritage and health profile. I carefully followed the directions and dutifully filled the sample tube with saliva. It took me nearly five minutes to produce enough spit. That was the most disagreeable part of the test. Several weeks later the results were posted to my personal site online. Most of the information was similar to my brother’s and, of course, 50% similar to my mother’s, both family members having completed earlier tests. There were a couple surprises. One is that there is no Native American DNA showing up on my father’s side. The family lore holds that my dad was 1/64th Abanaki. No such relationship was evident. On the contrary, the only possible Native American blood came from my mother’s side, and it was merely a trace. Most likely this DNA came into the family while my mother’s ancestors lived in the Ukraine during the middle of the 1800s. Someone might have mated with a Russian of Siberian heritage. My mother’s family is almost exclusively of German ancestry that moved to the Ukraine at the invitation of Catherine the Great, then onto the plains of America at the turn of the last century. They were all farmers. The most surprising revelation to me was the relatively high level of Neanderthal variation in my DNA. The Neanderthals are often called a species of human that came out of Africa, moved into Europe and went extinct with the advance of modern humans. Turns out that picture is not as clear as once supposed. Neanderthal DNA seems to be turning up regularly in individuals of European descent. My own DNA has 299 variants, greater than 81% of people who have been tested by this company. Neanderthals can not have been a separate species from human or they would not have been able to interbreed and produce viable offspring. Neanderthals were actual humans. Research into their caves and burial sites is showing that these people were not the brutish, stupid cavemen once imagined. They had sophisticated societies with weaponry and knowledge of animals and plants including medicinal plants. They cared for their old and infirm. When an individual died, the others provided a decent burial. There is also evidence of cannibalism, so I guess not everyone was treated the same. Perhaps they ate their enemies or their particularly venerated elders? So DNA testing has shown that Neanderthals did not go extinct, they became us. Many of us would not exist without their genes. Somewhere in the dark and misty past, Neanderthals combined with what is considered modern humans to produce us; ultra-modern humans, I suppose. Or perhaps we are merely glorified cavemen coping in the modern world we have constructed? As I contemplate another gray, chilly day in Maine and gaze out across the snow-covered fields, my thoughts wander to the sunny coast of Spain. In February of 2011, my mother and I traveled to Torrox on the Spanish Sun Coast to escape England’s dreary winter for a week. While there we took a local bus to Nerja, (pronounced Nair-ha) just up the coast, to visit a natural wonder of the Andalusia region, the Caves of Nerja. This underground formation hosts over 450,000 visitors per year. 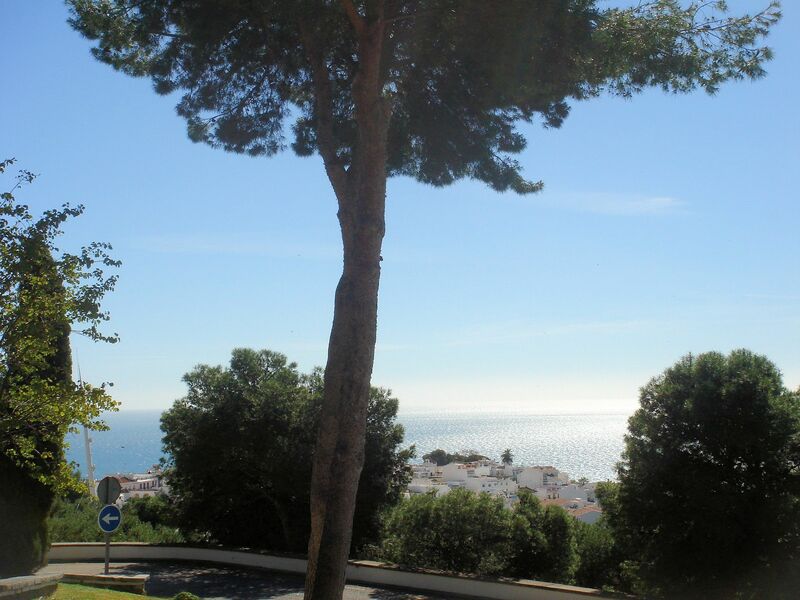 The photo above was taken from the Balcon de Europa, a vantage point in Nerja, toward the Sierra Almijara, the mountain housing the cave system. The mountain range consists primarily of dolomite marble formed on the floor of the Mediterranean during the Triassic period. Tectonic forces drove the rock seabed into the sky, creating mountains. Calcium carbonate is a porous stone subject to being dissolved by the corrosive effects of acidic rainwater. Since the formation of the mountains about 5 million years ago, rainwater has been seeping into cracks in the marble. Slowly, the water eats away at the rock until great caverns result. 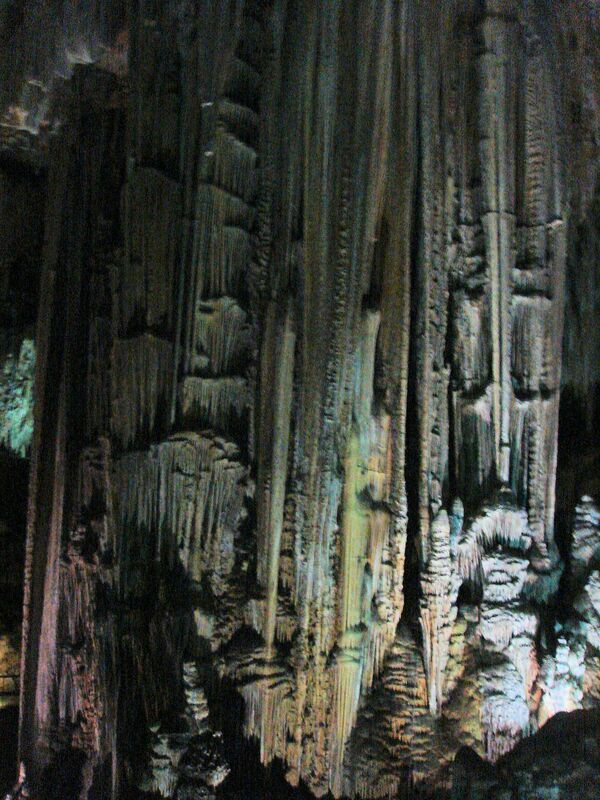 The drip formations (called speleothems) began to take shape in Nerja Cave about 800,000 years ago. 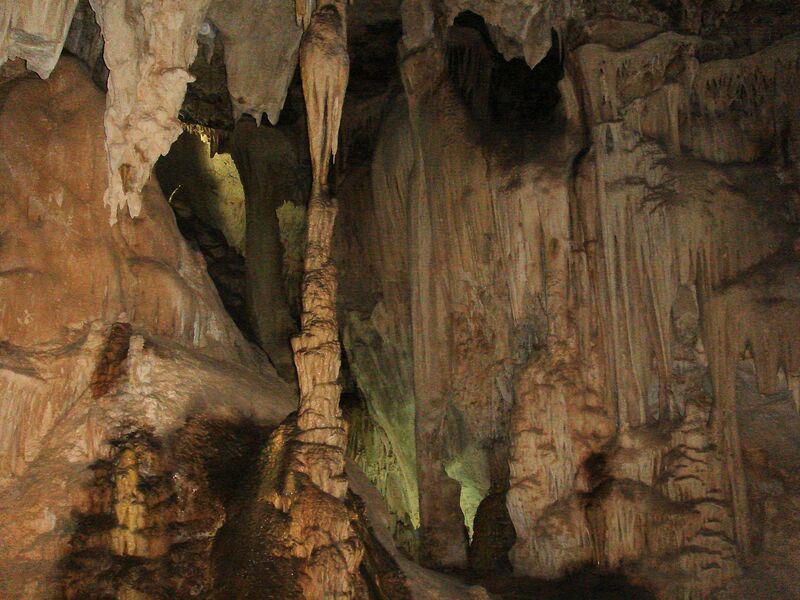 The cave system is comprised of three main galleries that run nearly horizontally for about one-half mile within the southern side of Almijara Mountain. The tourist entrance is located 518 feet above sea level. The interior hollows are between 627-404 f.a.s.l. One gallery is open to tourists and the drop from the entrance to the lowest floor is about 115 ft. The ambient air temperature inside the caves averages 64F. The constant flow of water makes the environment humid. 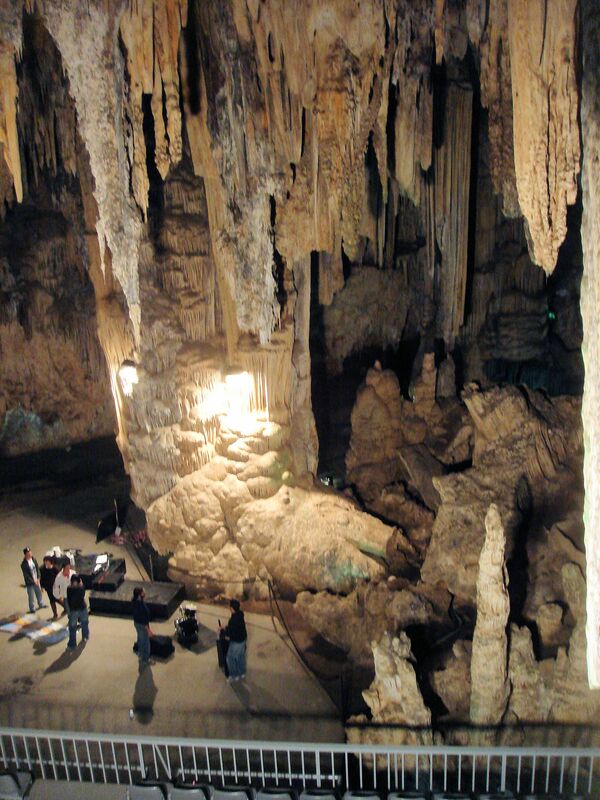 The cave even boasts a World Record: the widest naturally formed column, a speleothem 105 ft high and 42.6 ft x 23 ft at the base, and getting bigger every day! The caves are currently situated well above the water table so there are no lakes inside. The galleries are divided into halls. Some of the halls are impressively huge with soaring cathedral ceilings. One hall has been fitted with stadium seating and a stage where a music and dance festival is held every year. The hall provides great acoustics. The caves were discovered in 1959 by five boys who were trying to observe bats. They had seen the bats exit from a sinkhole, so they crawled inside. The sinkhole was one of two natural openings into the caves. The kids explored a bit until they stumbled across two skeletons. Frightened, they rushed home to tell the rest of the town about the find. Since then, Nerja Cave has been extensively studied. Excavations showed humans began to inhabit the caves about 25,000 years ago. At first they were part-time residents during the fall and winter. They subsisted on locally hunted prey such as wild horses, cattle and goats. When humans were not present, hyenas, lynx, birds and bats lived in the caves. Paintings on some of the walls have been dated to as far back as 20,000 years. They were etched or painted mostly in black and red and depict the fauna of the times and also geometric designs and symbols that likely had great significance to the artists. About 21,000 years ago, humans took up permanent residence. Since the caves are located within two-thirds of a mile of the sea, much of the cave dwellers’ diet consisted of fish and seafood. They supplemented their meals with rabbit and plants. Around 4500 BC pottery production began in the caves. Later, the unique shelter was used to house cattle and as a necropolis. 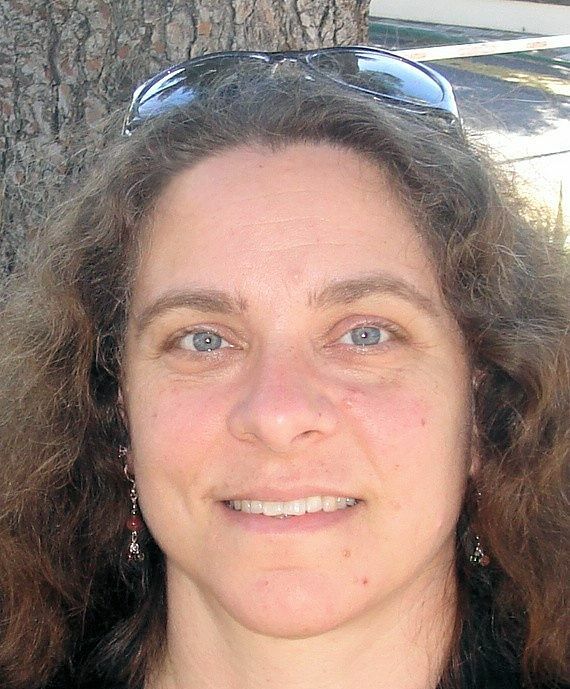 Neolithic burials, such as the bodies found by the boys, have provided DNA that allows researchers to trace some individuals to an African origin. The skeletal remains are considered a rich funeral record of Andalusian prehistory. Many other artifacts such as beads, arrows, fish hooks, other tools, loom weights and pottery have been recovered from the living spaces of the cave. Around 4000 years ago, the cave was sealed by rocks and sediment, likely from flooding. All its treasures were conserved until modern times. My mother and I visited on what was for Spain a sunny, warm early spring day. There were plenty of other tourists around, although the place was not crowded. The administrators limit the number of people allowed in the caves at any one time. Because people produce CO2 and moisture as they breathe, their numbers must be within the capacity of the air conditioning system installed in the caves, or their simple breathing would damage the caverns. There was a soft flow of air at all times when we were inside. The sound of dripping water was constant. Flash photography is not allowed in the cave, but lighting has been set up to showcase the lovely colors and forms of the rock flows. 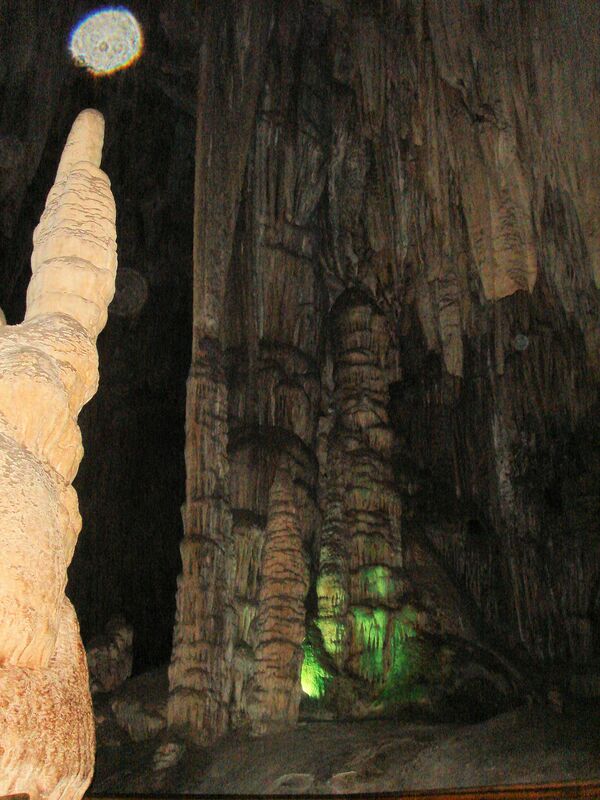 The formation shapes are given names such as macaroni, pineapple, cauliflower, nails, flag or pearls in addition to stalagmites, stalactites and columns. A substance called moonmilk forms from the detritus carried in the dripping water. This material builds up in sheltered pockets into a whitish powder deposit that has a pudding consistency when saturated. Moonmilk has sometimes been used in cosmetics. Tiny rivulets flow alongside and beneath the walkways in many places. In several areas, my mom and I both noticed significant changes in air pressure causing popping in the ears and heaviness in the sinuses. There were many staircases to climb and descend, giving us a thorough workout. As I reviewed the photos for this article, I noticed several orbs present in some shots. My understanding of these photographic artifacts is that they occur when a bit of dust is caught in the camera flash, causing a circular burst of light to be recorded. What I don’t understand is why there are orbs in my photos since I did not use a flash, it was prohibited. I have enhanced most of the pictures here by lightening them to simulate the flash. Here is an example of a before-editing and after-editing picture. The editing program brightened the scene and emphasized the colors present in the rock. Here is a photo with several orbs evident. In the brightest one I can almost imagine a face, with the eyes and nose. It looks a bit intimidating. Are these artifacts merely a reflection in a low-light environment somehow generated off specks of dust or are they something different? Are there energy orbs present? Only a psychic would know if the spirits of the ancients linger in the caves. Would it be surprising to find such presences in a place inhabited by so many generations of humans; an underground repository for the dead, no less? After all, we modern visitors are tramping through their cemetery. No wonder the orb looks angry! 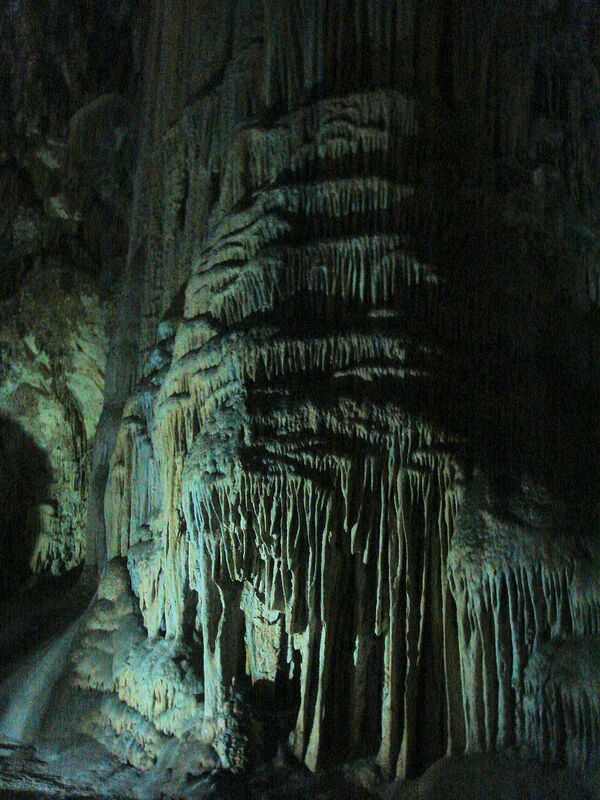 All psychic phenomena aside, the caves truly are an amazing, even spectacular, sight. 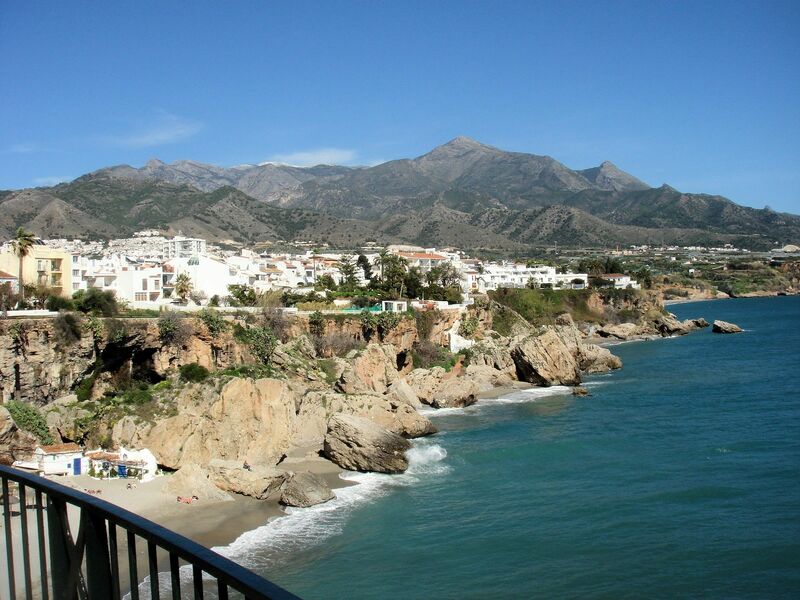 They and the nearby town of Nerja with the Balcon de Europa, and the narrow streets lined with quaint shops and tiny eateries are well worth a day trip for any visitor to the Sun Coast. Here is one last shot, the delicious lunch I enjoyed with my mum after touring the caves. 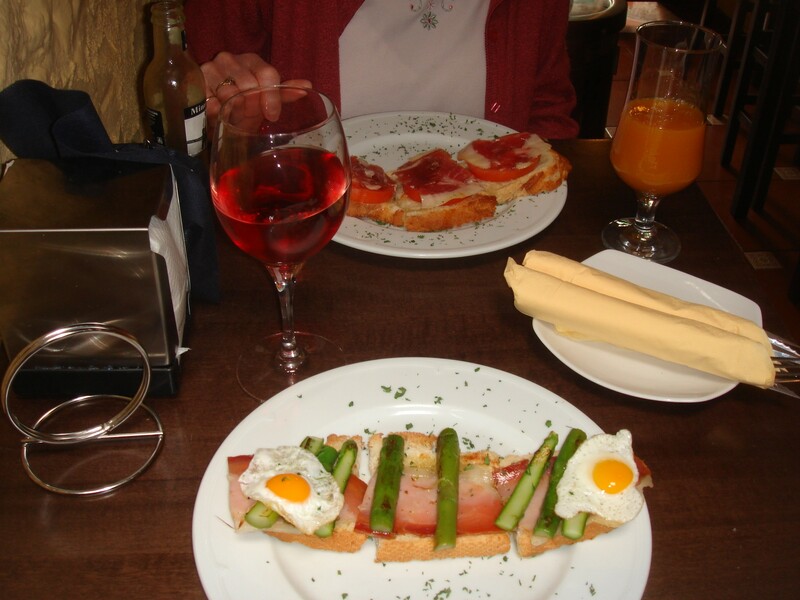 My meal was a toasted sandwich made with the prized regional dry-cured Iberian ham, olive oil, fresh roasted asparagus, herbs, and tiny quail eggs, with a glass of local rose. Mums had a fresh tomato and melted cheese sandwich with mango juice. Delicious!